McIntosh MC1.25KW is 71kg, 1200-watt monoblock amp | What Hi-Fi? Priced at a wallet-bothering £15,000 each, the balanced power amp is the brand’s most powerful single-chassis monoblock amplifier. 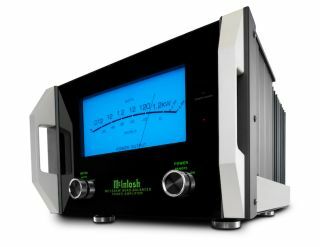 We'd love the know how much coffee McIntosh's engineers got through this year - since the summer, the American hi-fi brand has announced several amplifiers (including its most powerful ever integrated model, at 300 watts per channel) and first hybrid integrated amp. Now we can add the MC1.25KW monoblock model to that list. Sitting below McIntosh’s three-piece, 2000-watt MC2KW, the MC1.25KW directly replaces the MC1.2KW. On paper, at least, it’s had quite an overhaul - “redesigned from top to bottom”, in fact. The MC1.25KW includes a 50 per cent increase in filter capacity (with the aim of improving bass and dynamic performance), upgraded circuitry and power transformer, and the addition of McIntosh’s power management system (which turns the amp off when no input signal is detected). The stainless steel chassis also sits on four newly redesigned, chamfered feet. As you’d think necessary for an amplifier capable of 1200 watts of power, there are four heatsinks towards the rear of the chassis. They are connected to output transistors McIntosh claims can eliminate heat so quickly no warm-up time is required. Aesthetically, the front panel (which features McIntosh’s signature control knobs and illuminated logo) has new LED backlighting, intended to improve appearance and colour accuracy. Around the back are both balanced and unbalanced outputs. The MC1.25KW, priced at £29,995 per pair, will be shipping this month (US) and next (UK).